Hello! Welcome to the Day 3 of Taylored Expressions October Sneak Peeks! The Creative Team is continuing sneak peeks today. All products will be released tomorrow, Thursday, October 1 @ 7 AM PST. 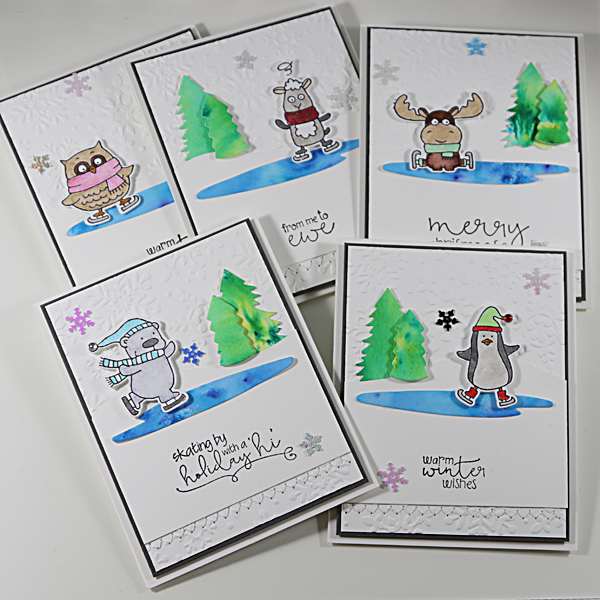 Today I have a set of cards using Critters on Ice (stamp set and coordinating die set sold separately). I watercolored each character and created a little scene using Build a Scene - Central Park (pond) and Build a Scene - Winter Trees. 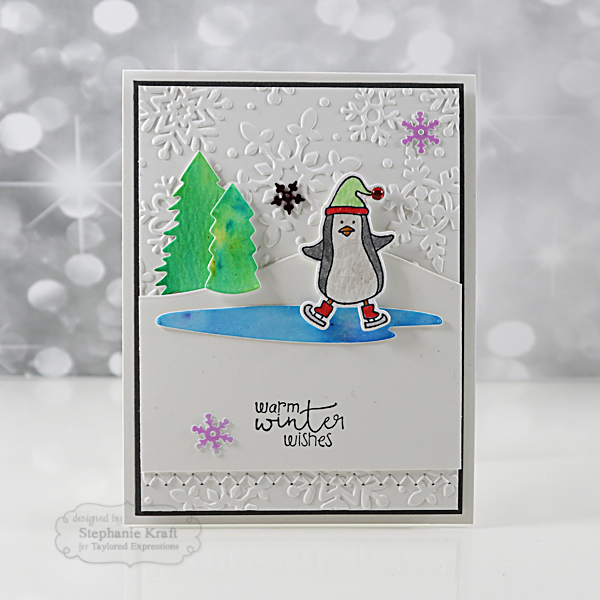 The background of each card was embossed with the Winter Flurry Embossing Folder. I also added a few sequins from the Build a Scene - Christmas collection. Accessories: Taylored Dies: Critters on Ice, Build a Scene - Central Park, Build a Scene - Winter Trees, Build a Scene - Rolling Hills; Winter Flurry embossing folder, Build a Scene Christmas sequins (TE); Zig Clean Color Markers, Brusho Crystals, Wink of Stella Clear Glitter Pen, Queen & Co Bubbles, Foam tape, Thread, Sewing machine. I ice skated a lot growing up...brrr... it was cold but we loved it! So these critters won my heart! Just can't get any cuter Stephanie! Awesome set of cards!